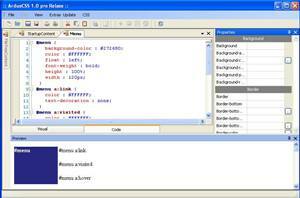 Edit CSS files through visual interface. Edit CSS through text editor with syntax highlight. CSS compression to optimize site performance. Preview in external CSS files. Edit CSS property through dialogs. Show preview of the editing file. The ArduoCSS is available as a free download from here and requires .NET Framework 2.0 to run.